I must admit that I failed Kyoto in many ways. When I arrived, I was suffering from a cold and had grown weary. After dropping my luggage at the hotel (I chose to splurge), I headed for the ancient city and the bamboo forest walk. I longed to experience the bamboo trees swaying in the winds above Shinto shrines, singing and dancing, possessed with the spirits that the ancient Japanese so fervently worshipped. What I found was a massive amount of tourists. Now, I am also a tourist, but I just wasn’t feeling it that day. The crowds were too much, and my body needed rest. So, I got some medicine, went back to the hotel, and went to sleep. The next morning when I reached Tenryu-ji Temple and the Bamboo Forest Path it was, for the most part, empty. There were the workers who tended to the grounds, raking the rock paths, sweeping the gardens, and selling the tickets. There were a few photographers who carried big camera bags and tripods. They moved silently liked snipers through the temple complex, seeking the ideal position for the perfect shot. And I moved among them. Enjoying the peace. Not talking to anyone. Spending time with the scenery and myself. This macaque monkey was perched right at the overlook. You can see Kyoto behind it. 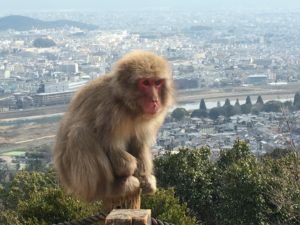 When I crossed the Togetsu-kyo Bridge and headed into the Arashiyama Monkey Park, I found myself continuing to pursue the silence. There were the sounds of the birds beneath the canopy of trees, and construction was happening somewhere down the hill in the city itself. But I kept my eyes to the path or to the trees. A group of school children, probably in kindergarten, were ahead. There was a collective bit of shouting that occurred when they encountered their first monkey and a little more when they discovered a playground near the top of the hill, but it didn’t bother my taciturn mood. Their joyful cries seemed simian to me, and I just imagined that they had joined the ranks of the macaques that ruled that hill. When I reached the overlook, I had the opportunity to speak with a number of people, the gaijin tourists, the Japanese park employees, the teachers who worked with their tiny charges, but I didn’t. I looked out over Kyoto. I had thought Osaka was big, but now I could see Kyoto in all her modern glory. But I didn’t want her now. I wanted the Kyoto of the past. The monkeys and I glanced at one another quietly for the most part. One hung overhead and eyed me cautiously as I made my way down the hill. I was heading for the Kinukake-no-michi trail to visit three more temples, but he didn’t know that. With the help of a rickshaw runner, I got directions on which bus to take, and I headed out. Even on the bus, I was quiet. I observed the city as I passed through it. I saw an older woman on a bike come dangerously close to the side of the bus just beneath my window. I saw work crews and road crews everywhere, building and rebuilding. I people running to work or from work, school kids going to get some lunch, tourists busily regarding maps and then dashing in different directions. When I reached Ninnaji Temple, I decided to eat, and, while I did talk, it was only a little. This is the nice lunch special, minus the sorbet, that I got at Sakon. The sashimi, which is at the top of the tray, was fresh and well prepared. To the left: That’s Ayumi, my waitress. All of the staff at Sakon were great. 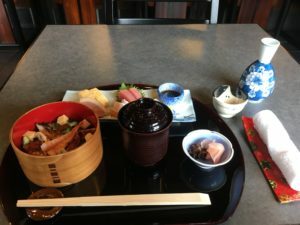 I found a cool little restaurant called Sakon. It’s located right across the street from the temple entrance, and it has a really nice lunch special. I enjoyed the traditional Japanese cuisine with some warm sake and the Jazz they played on the sound system. 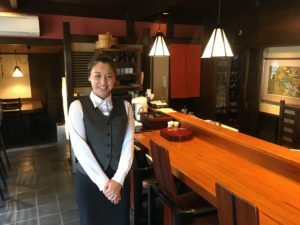 Ayumi, the waitress who served me, was pleasant and helpful. We communicated a little about the dishes by using Google translator, but, other than that, it was a quiet lunch. I will say that the lemon sorbet that they served for dessert was a perfect choice. It matched the sashimi that I had already eaten. Plus, they placed it before me with a cup of hot brown tea. I visited Ninna-ji Temple and then Ryoan-ji Temple. Both were beautiful in different ways, both crafted in the spirit of Zen Buddhism. I enjoyed their rock gardens, their pools and ponds, their pagodas and shrines. But I knew that I was heading further up the hill. Susan, a former student of mine who had taught in Japan, told me that if I ever visited Kyoto that I must see the Golden Pavilion–Kinkakuji Temple. Like the day before, I was swimming through a throng, but I was so captivated by the beauty of the building that glimmers over a green waters and beneath the blue sky. I offered to take pictures for families and friends, and I took some of my own. I laughed as a woman asked for directions on how to ring the gong on the Shinto shrine and then assaulted it like she was on a game show. She even surprised herself with her own ferocity, and then blushed and started to step away. Then she quickly remembered herself and gave a dutiful bow. I wasn’t in ancient Kyoto. I was in the Kyoto of today. I was watching the lives of people, working and trading, engaged in commerce, sharing in their history but doing so in the present. So, how did I fail? I could have made a greater effort to engage in conversation, to meet the locals, to hear their stories. And I didn’t. But I did see kindness–a lot of it. There was the rickshaw runner and the police officer and the businessman who helped me as I navigated the bus routes. There were the people on the buses, giving up their seats for their elders, making room for another person who was getting on. There were the school children on the JR train I took to Arashiyama that morning, all in their uniforms (different ones for different levels), discussing the homework that they would likely be quizzed on within the following hours. It seems to be a theme in Japan. Everyone is working together–even when they are going to work or to school. In Europe and in America, I see a lot of homeless people, especially in cities. I haven’t seen them here. I have seen a lot of older men and women working jobs–directing traffic, managing shops, or tending to ancient gardens. I’ve seen postmen on motorbikes driving to each stop, hopping off, running to the box, and then running back. In fact, I’ve seen a lot of running people of all ages–making sure that they were on time, getting it done because it needed to get done. I’ve even seen Buddhist monks in full regalia sprinting like they were in the Olympics. As I walked through the ancient wonders of Kyoto today, I sought a stillness in myself. The Japanese are still when they are riding the train or the bus. Often they close their eyes, a rock with the motion of the carriage. Maybe the Kyoto of yesterday is still here? Maybe the past and the present and perhaps even the future are swirling in the winds above the bamboo path, are in the melded cries of the monkeys and daycare children, are in the dashing man who is the still man when he rides a train, are in the couples who rent kimonos and shuffle through ancient gardens while holding hands, are in the few blossoms that have emerged to whisper to the winter cold that spring will soon arrive? What I do know is that there is life here in Japan’s ancient capitol and that tomorrow the pulse of buses and trains will begin again as a Kyoto breathes in perpetual meditation.